I've written before about my love for the duralex picardie tumbler. Many times, I think. I showed a picture of this tumbler just after I'd made it. When I was glazing on Thursday I really debated on its color. Almost all of my white glaze didn't get mixed well enough and/or didn't have enough pigment in the bucket, and half of my yellow had the same problem. I mixed new glaze and redid them yesterday, but old reliable blue turned out just fine. Ish. I'm not sure what I was striving for - that's not true. I know exactly what I was striving for. A duplicate copy of the picardie. I wasn't really happy with this tumbler when I pulled it out, not really happy with it when I photographed it, but now that my Sunday morning coffee is in it, it may be growing on me. 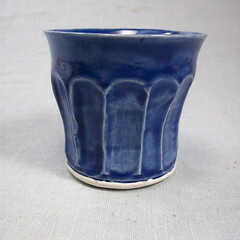 It feels good in my hand, the base is pretty well weighted yet it is lightweight (as lightweight as pottery can be, and the equivalent of my favorite bamboo tumblers). Whether I'd make more or not is another question. It was fairly labor-intensive (see this post) and I haven't changed my mind about what it would cost ($15 range). I think I might like it better if it were colored inside with a white exterior. I'll have to play around with it a little more. One possible way to make it more like I want it would be to make another, make a mold, and slip-cast the piece. I got a copy of Andrew Martin's revised slip casting and mold making book this week. It gave me new insight into how I could make some of the pieces that I love but are too tedious for production work. So, what's the verdict on this? Should I try to make more? Thanks for any and all feedback.